- VILHENA RODRIGUES Antonio josé Q.B. It's not everyday you lend your "sports gear" to the opposition, but for Timaru woman Linda Pullar it's all about sportsmanship. 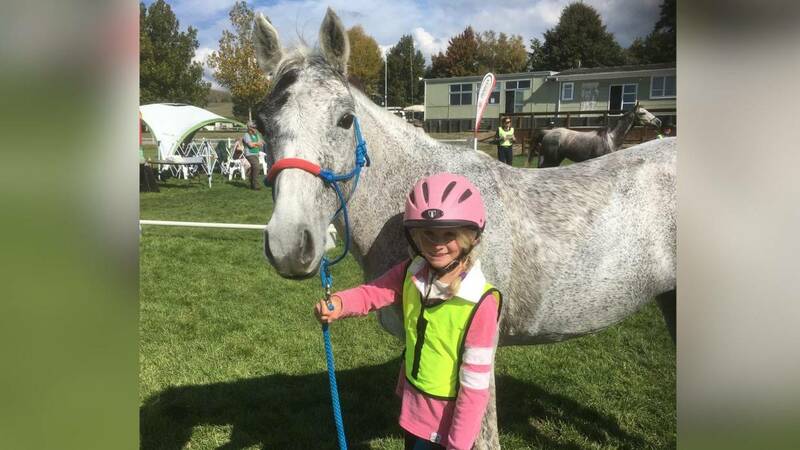 While Pullar will not be competing in the trans-Tasman 120km endurance horse riding event in Nelson next week, two of her horses will – carrying Australian riders. While many poeple would question the rivalry, Pullar said it was all about sportsmanship and prestige. Her Kishon Arabian stud has become internationally known for producing endurance horses with two already sold overseas. The trans-Tasman event was a good way to enhance that reputation she said. And athough she still hopes to be selected for the New Zealand team one day, in the meantime she has the satisfaction of seeing the horses she has trained taking part in the event. Pullar has clocked up nearly 2000km on her nine-year-old horse Kishon Fashamatazz, which one of the Australians will ride. Kishon Abigail, at seven years old, is not quite as experienced, but will be the ride for a second Australian team member . While preparing two horses would be work enough, Pullar has also qualified a further two horses as "spare wheels". Unfortunately one of the wheels has already fallen off as one horse has contracted mud fever due to the recent damp conditions and will not compete. Kishon Brittany Blue, owned by her daughter Veronica will now be the sole travelling reserve. The Australian riders will try out the horses the day before the race, then deciding on which to compete. Pullar said hopping on a new horse was not a problem for experineced riders. "They know how to drive, and where the gears are, they just have to adjust to the different model." So is she right? While I haven't ridden for nearly two years and was never a spectacular jockey at the best of times, I took up the offer and saddled up for some endurnace training of my own. I certainly hope the Australian riders are better than me because after I had spent two minutes on the sprightly Fashamatazz, Pullar suggested I board the somewhat more sedate Brittany. But after going round the block at an energetic trot I soon understood how a well-trained horse made the rider's job that much easier. While Brittany might be the "spare wheel" she gave me a great ride home – safely, securely and even left me without a sore bottom. Trans-Tasman rivalry will be at its fiercest in the new year when New Zealand's top endurance riders, including Marlborough's Linda Harmon, take on their Australian counterparts at Twynham Farm near St Arnaud. Harmon, riding Landon V-erah, is a member of the four strong senior team that will face the Aussies in the CEI three star 120km ride on Tuesday. Fellow Marlburian Helen Graham will compete in the junior team that races over the same distance while Kimberly Ryan is a reserve for the team. For Harmon it will be her first chance to compete in the New Zealand team. She was named as a reserve last year against the Australians and rode as an individual then had to pull out of the team's trip to Spain after her horse pulled up lame. While she describes the Australians as a bit of an unknown quantity she is determined to retain the title New Zealand won in Australia last year. "We really have to thrash those Aussies," she said. The Australians will be at the disadvantage of riding borrowed horses for the race, something Harmon hopes will give the Kiwis an edge. ""When you've got your own horse you know its little ways," she said. "You know when to push them and when not to." Landon V-erah, or Abbey for short, is a young horse at seven years old and the 120km ride will be the longest she's ever tackled. "I'll guess we'll see what she's got under the bonnet," Harmon said. The riders will be faced with a variety of conditions from open flats, to rolling hills, steep forestry blocks and clay tracks through native bush. However, it is nothing new to Harmon who has tackled the course on numerous occasions before. With the Marlborough summer finally heating up Harmon is hoping temperatures and the humidity stay on the low side. On hot days strappers become especially important, as Harmon explained. "If you don't have a strapper you are too busy looking after your horse and not yourself." Harmon's husband Malcolm is set to take on the strapper's duty this weekend something Harmon is pleased about. "Its great, it means I can yell at him," she laughed. The meeting will also double as the South Island Endurance champs with Marlborough's Kylie Avery riding in the CEI two star 100km on Monday. AL KHALDIYA Stable's Layla Al Ridha of the UAE notched the women's 80-km race while Abdulla Al Khatri of Al Asayel Stable took the 120-km junior competition of the Kingdom Endurance Horseride Championship at the Bahrain International Enudrance Village in Sakhir. The women's race, which was divided into three stages, featured stiff competition among 15 riders, specially in the last stage as Layla crossed the finish line first in three hours 10 minutes 40 seconds. Layla was ahead of her main opponents Maryam of Al Fateh Stable (3:15:57) who finished second and Royal Endurance Team rider Manal Fakhrawi (3:20:24) who came third. Thirty riders were in the fray for the five-stage junior race which was won by Abdulla who completed the race in five hours, three minutes and 21 seconds after a tough battle with Royal Endurance Team members Mohammed Abdulaziz (5:03:30) and Shaikh Mohammed bin Khalid Al Khalifa (5:23:36) who were second and third respectively. A 60-km qualifying race for new and young riders, was also included in the event with 15 riders in the fray. The championship was held under the patronage of Prince Al Waleed bin Talal, chairman of event sponsors Kingdom Holding Company and attended by Kingdom Stable director Najeeb Al Burjus who flagged off the race and honoured the top three riders in each category at the presentation ceremony. Al Burjus congratulated the winners and praised the efforts of the organisers and the impressive number of riders in all three races, specially in the women's event which was organised for the first time. Al Burjus thanked Bahrain Royal Equestrian and Endurance Federation president Shaikh Nasser bin Hamad Al Khalifa who gave his directives to host this race. Abu Dhabi: Last Thursday Ali Mohammad Al Muhairi shrugged off the misfortune of having to sit out of the UAE team and chipped in crewing for the UAE team which registered a golden double triumph in the Doha Asian Games endurance event in Qatar. Yesterday at the Emirates International Endurance Village in Seih Assalam, Al Muhairi compensated himself with a superb display to win the Shaikh Rashid Bin Hamdan Al Maktoum Challenge 120-km ride. Al Muhairi, who is the Racing Manager for Shaikh Hamdan Bin Rashid Al Maktoum, Deputy Ruler of Dubai and Minister of Finance and Industry, was back on the consistent performer Karabil Narmar, and the reunited pair won the same event after a two-year gap from a strong field of riders. In fact Al Muhairi's win in yesterday's 120-km Open event halted the winning streak of the Al Reef Stables who have won all four rides of the season so far. Al Muhairi and Karabil Narmar won the 120-km ride in four hours 46 minutes and 59 seconds at an average speed of 25.09 with Al Reef's young star Omair Hussain Al Bloushi finishing second on Cameo Zinniaa, about three minutes later. Both rider and horse drew praise from Shaikh Hamdan, who attended the ride organised by the Dubai Equestrian Club. "Ali Mohammad Al Muhairi is a skilled rider and he did well to regain the initiative after the third loop. "The climate was very good and Al Muhairi brought the best out of Karabil Narmar, which was coming out of an injury," Shaikh Hamdan said. "He was running after a long gap but soon looked like the top quality horse that he his. Al Muhairi paced his effort very well and they fully deserved to win," Shaikh Hamdan said. The winner said he was pleased with his effort. "It was a good ride and after leading in the first two loops I slowed down the pace to check out how my horse was faring. Once he looked good after that loop we regained our pace," said Al Muhairi. "We started out to go out and win this ride and I knew I could do it on Karabil Narmar," he said. Commenting on his Asiad misfortune, Al Muhairi said: "I really enjoyed being part of the team. We all chipped in with crewing for the UAE team and we are proud of the UAE's achievement." Al Muhairi has been a regular in the UAE national team. Extending the good run by foreign riders here this season, Maria Mercedes Alvarez Ponton finished third. Malta's Maria, who has won a ride here a couple of seasons ago, rode Nobby, a horse trained and owned by her rider-trainer husband Jaume Punti Dachs of Spain. "This is the first time I am riding this horse which has just come to the UAE. Nobby has some good results under his belt in Europe but this is his first outing here and I had to keep this in mind while riding today," said Maria. 10. Jesus Manuel Berna (Out of the Blue) 5:15.16. Abu Dhabi: Shaikh Hamdan Bin Rashid Al Maktoum, Deputy Ruler of Dubai and Minister of Finance and Industry, said that if endurance became an Olympic sport the UAE had a very good chance of winning the gold medal. Speaking to reporters at the Emirates International Endurance Village in Seih Assalam during the Shaikh Rashid Bin Hamdan Al Maktoum Challenge ride yesterday, Shaikh Hamdan praised the display by the UAE endurance riders who won two gold medals and a bronze medal in endurance which made its debut in the Doha Asian Games. The FEI, the governing body of equestrian sport has been making efforts to try and get endurance included as an Olympic discipline. "If Endurance Riding becomes an Olympic sport the UAE, which is a dominant force in the discipline, have a 90 per cent chance of winning it," he said. Shaikh Rashid Bin Mohammad Bin Rashid Al Maktoum won the individual gold in the 120-km endurance ride at the Doha Asiad and along with Shaikh Hamdan Bin Mohammad Bin Rashid Al Maktoum, Shaikh Ahmad Bin Mohammad Bin Rashid Al Maktoum and Shaikh Majid Bin Mohammad Bin Rashid Al Maktoum won the team gold. Sultan Bin Sulayem won the bronze medal in the individual category. SIXTY riders are set for the Kingdom Endurance Horseride Championship scheduled for tomorrow at the Bahrain International Endurance Village in Sakir. The event, comprising a 80-km race for women and 120-km race for juniors, is being organised by the Bahrain Royal Equestrian and Endurance Federation (Breef) and is part of Bahrain's National Day and His Majesty King Hamad's accession to the throne celebrations. The women's race, sponsored by Saudi Arabia's Kingdom Holding Company, is divided into three stages with 15 riders in the fray. The race consists of two stages of 30 kms and a final stage of 20 kms. Among the participants in the 80-km race will be Bahrain's Royal Endurance Team members Manal Fakhrawi and Sumaya Jassim, Layal Abdulaziz of Al Khaldiya Stable, Shaikha Najla bint Salman Al Khalifa of Ahmed Al Fateh Stable, Huda Aryan of Saar Equestrian School and a team from Saudi Arabia's Kingdom Stable. Thirty riders are in the fray for the 120-km juniors race, split into 30 kms for the first two stages, 25 kms for the third, 20 kms for the fourth and 15 kms for the fifth. Top Bahraini riders in this event are Mohammed Abdulaziz, Jaffer Abdulnabi and Mohammed Abdlsamad of Royal Endurance Team, Tawfeeq Al Qattan of Hawar Stable, Ali Abduljalil of Azadi Stable and Abdulla Al Khatry of Al Asayel Stable. A 60-km qualifier will also be held on the sidelines of the main event which is also open for women. Fifteen riders from Bahrain, the UAE and Kazakhstan are taking part in this event. This qualifying race will be organised for the new riders and is divided into two stages of 30 kms each. Meanwhile, Bahrain Royal Equestrian and Endurance Federation president Shaikh Nasser bin Hamad Al Khalifa met Kingdom Stables director Najeeb Al Burjus who arrived in Bahrain to meet the member of his team and inspect the facilities as well as the preparations being made for the championship. Al Burjus said the stable, owned by Prince Al Waleed bin Talal, is always keen to take part in Bahrain races to gain more experience. Shaikh Nasser thanked Prince Al Waleed, who is the Kingdom Holding Company chairman, for his personal support to the federation and the Kingdom Stable for taking part in Bahrain races. 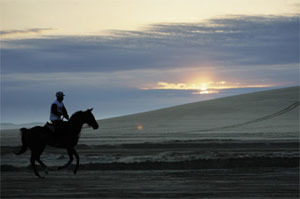 Dubai: The Dubai International Endurance City plays host tomorrow to the Shaikh Rashid Bin Hamdan Al Maktoum Challenge. The FEI 120 kilometre ride starts at 6am tomorrow morning from the Dubai International Endurance City, there will also be a 40 kilometre and an 80 kilometre qualifier. Before a horse or rider can ride in a 120km race they must first complete a 40km and an 80km race. Shaikh Rashid Bin Hamdan Bin Rashid Al Maktoum has been competing in Endurance Racing for five years, both internationally and locally, and in 2004 won the Triple Crown series run at Dubai International Endurance City. The Shaikh Rashid Bin Hamdan Al Maktoum Challenge is part of the Dubai Endurance Challenge. The Challenge is worth Dh700,000 and will take in all FEI rides staged at the Dubai International Endurance City for the 2006 - 2007 season into account. During the season riders, trainers, horses and stables will earn points depending on their finishing position in the selected races. At the end of the season the highest point scorers will be crowned the Dubai Endurance Challenge Champion Rider, Trainer, Horse and Stable. Entries for the endurance rides continue to stay at record levels showing the increasing popularity of the sport and the number of new riders beginning to compete. The Dubai International Endurance City is easy to get to, from the Dubai Autodrome roundabout on the Emirates Road, follow the signs to the Bab Al Shams Desert Resort and Spa and the venue is located beside the hotel. A TOTAL prize money of BD23,000 is up for the grabs in the Kingdom Endurance Horseride Championship scheduled for Saturday at the Bahrain International Endurance Village in Sakir. The event, comprising 80-km for women and 120-km for juniors, is being organised by the Bahrain Royal Equestrian and Endurance Federation (Breef) and is part of Bahrain's National Day Celebrations and His Majesty King Hamad's accession to the throne. The prize includes BD12,700 for junior and BD10,800 for women. The top 10 in each event will be honoured at an awarding ceremony after the event. The women's race, sponsored by Saudi Arabia's Kingdom Holding Company, will of three stages with 30 kms for the first two stages and 20 for the third. A 60-km qualifier will also be held on the sidelines of the main event which is also open to women. The first two stages of the 120-km junior race consists of 30 kms each while the third stage will be over 25 kms and the fourth 20kms. The fifth and final stage will be of 15 kms. The 60 kms event, which will be organised for new riders, is divided into two stages of 30 kms each. Meanwhile, Kingdom Stables director Najeeb Al Burjus of Saudi Arabia arrived in Bahrain to inspect the facilities and the preparations being made to host this prestigious event. Al Burjus said the stable, owned by Prince Al Waleed bin Talal, is always keen to take part in tBahrain races to gain more experience. Breef first vice-president Shaikh Khalid bin Hamad Al Khalifa welcomed the participating stable from Saudi Arabia. Shaikh Khalid also thanked Prince Al Waleed, president of the Kingdom Holding Company, for his personal support to the Kingdom Stable. The race is being organised following directives from Breef president Shaikh Nasser bin Hamad Al Khalifa. Juniors: Winner - BD3,000. Runner-up: BD 2,500. Third place: BD1,500. Fourth place: BD1,200. Fifth place: BD1,000. Sixth place: BD900. Seventh place: BD800. Eighth place: BD700. Ninth place: BD600 and 10th place: BD500. Women section: Winner - BD2,000. Runner-up: BD1,700. Third place: BD1,400. Fourth place: BD1,200. Fifth place: BD1,000. Sixth place: BD900. Seventh place: BD800. Eighth place: BD700. Ninth place: BD600 and 10th place: BD500. Kimberley Ryan's win in the Marlborough endurance ride at Chestnut Valley, near Renwick, on Saturday should give the New Zealand selectors something to think about for the up coming Trans-Tasman Endurance Challenge against Australia. Ryan, riding for the Glendaar Endurance Stables on the grey Arabian gelding Dell Gamal, won the junior 124km NRM sponsored premier points event in a ride time of 10 hours 49.13 minutes. She now has a stranglehold on the South Island's sponsored series with one ride remaining. On the long list for selection into the New Zealand junior team, to be announced today, Ryan along with Helen Graham and open rider Linda Harmon make up a strong Marlborough line-up for the challenge to be hosted by Nelson Lakes on January 1 and 2. Graham and her Arabian gelding, Ra'oul Abu Rakheen, produced a stunning finish to win the junior 82km event in a ride time of 6.16.37 hours. Harmon's horse, Landon V'erah, sustained a puncture wound to her leg but the rider managed to stop the blood flow to finish third in the open 82km in 6.06.19 hours. Sarah Hamer and Rosewood Tahir from Timaru won the open 124km NRM ride in 10.30.52 hours, they also took home the best conditioned horse (BC) award. Hamer is also on the long list for trans-Tasman selection. Marlborough under 21 Sportsperson of the Year winner Kylie Avery returned to the podium with a close gallop finish in the open 82km class. Riding her mother's stallion, West Coast Zahav, Avery managed to pip Nelson rider Chris Bonniface by a short whisker to win in 5.55.01 hours. West Coast Zahav picked up the BC award. In the open 40km Canterbury's Jenny Worsfold and Sunnybrae Serene were judged first past the post in 2.31.17 hours. Rai Valley rider Kim Swan and Alamode Armani were second. Charlie Davis and Cheeko from the Waihopai took third with Cheeko receiving the BC. Open 124km NRM Premier Points (four starters, one vetted out lame): S Hamer and Rosewood Tahir 1; K James and Glendaar Arakis 2; B Priddle and JA GAI Kascade 3. Best conditioned horse: Hamer and Rosewood Tahir. Junior 124km NRM Premier Points (two starters, one withdrawn lame): K Ryan and Dell Gamal 1. Open 82km (five starters): K Avery and West Coast Zahav 1; C Bonniface and Radi 2; L Harmon and Landon V'erah 3; L Kenny and PL Mississippi 4; O Schreurs and Delights Antar 5. BC horse: Avery and West Coast Zahav. Junior 82km (two starters, one v/o sore back): H Graham and Ra'oul Abu Rakheen 1. 82km Novice (one starter): Qualified: Tampa de Oro. Open 42km (five starters): J Worsfold and Sunnybrae Serene 1; K Swan and Alamode Armani 2; C Davis and Cheeko 3; L Ryan and Naibara Gold Treasure 4; T Blunt and Hundalee Caly X 5. BC horse: Davis and Cheeko. 42km Novice (five starters): Qualified : Silands TricTrac, Silands Rhaffety, Stonelea Maverick, Sherdon Rakada, SH Wind Song. 25km Training (two starters, two eliminated o/time). MANAMA DEC. 14 (BNA)-- HIS MAJESTY KING HAMAD BIN ISA AL KHALIFA ARRIVED AT THE SILEEN AREA ON A VISIT DURING WHICH HE ATTENDED PART OF THE ENDURANCE RACE HELD TODAY AS PART OF THE 15TH ASIAN GAMES IN DOHA. The flag of the United Arab Emirates was flying high when HH Sheikh Rashid Al Maktoum won gold by crossing the finish line of the first Asian Games equestrian endurance ride to claim the individual gold medal after a gruelling 120km race through the Qatar desert. It was a dream finish for the UAE's Al Maktoum family, concluded the first ever Asian Games equestrian endurance competition. The team of four brothers finished with the gold medal and the eldest, HH Sheikh Rashid Bin Mohammed Al Maktoum, claimed individual gold on Magic Glenn, also known as Nashmi or 'The Brave' in Arabic. The three Al Maktoum brothers, HH Sheikh Rashid Bin Mohammed, HH Sheikh Ahmad Bin Mohammed and HH Sheikh Majid Bin Mohammed, came in with a riding time of 18:55:23 for the 120 kilometres. Fourth member of the team, HH Sheikh Hamdan Bin Mohammed Al Maktoum counted as the team's dropped score, after his horse was eliminated at the third vetiniary gate. The Bahraini team, with two of its riders finishing, clinched silver. Bahrain's best rider, HH Sheikh Nasser Bin Hamad Bin Isa Al Khalifa, riding Shar Rushkin, took individual silver, after crossing the finish line just over three minutes after the winner. HH Sheikh Nasser had opted to ride the last lap alongside HH Sheikh Rashid. On the final 10km of the race HH Sheikh Nasser told reporters: "I need a massage." The third rider to cross the finish line was Dubai businessman Sultan Bin Sulayem, starting as an individual rider for the UAE. Time-keeping proved to be a problem at this first Asian Games endurance ride and, after the first two laps, the ground jury and their team of stewards resolved to register the times manually by stopwatch. What was planned to be a first for a modern timing system that works through an electronic chip to be read by a base unit, did not work satisfactorily and was abandoned during the competition. The final results took some time to compute, when Qatar�s Fahad Mohammed Adhajri was confirmed as fourth place in the individual event. In the team event, Qatar performed better, receiving the bronze medal, behind winners UAE and second-placed Bahrain. DOHA, Dec 15 (Bernama) - Malaysia's lone rider in the 120km day-long equestrian endurance race that made its Asian Games debut Thursday, dropped out of the race prematurely when his horse suffered a strained fetlock (just above the hoof of a horse's leg). Rahman Azman Muhammad, riding the Raja Muda of Kelantan's nine-year-old gelding named Colorado, had arrived at the first vet gate (checkpoint) 30km into the route in 29th position behind a host of riders from the gulf nations. "The track was wet due to overnight rain that had washed away the soil and they had covered potholes with loose sand. Unaware of the condition, my horse stumbled and strained a fetlock," Rahman said at the Mesaieed race course situated an hour's drive outside Doha. Rahman who completed the first 30km in 1 hour 40 minutes and 50 seconds reached the second checkpoint an hour and 40 minutes later before dropping out. Prince Sheikh Rashid bin Mohamed Al-Maktoum of United Arab Emirates (UAE) completed the gruelling race in 5'45:49s to win the gold and added the Team gold when three out of four riders in his team finished the race with a total time of 18'55:23s. Sheik Nasser Hamad Al Khalifa from Bahrain took the silver while Sultan Bin Sulayem from UAE finished with a bronze. The team gold, silver and bronze went to UAE, Bahrain and Qatar. Among the 51 competitors who headed out into the desert after a mass start at 6am were four members of the UAE royalty, three from the Bahraini princes, two Saudi princes and the 18-year-old Qatari prince, son of the Emir who was given the honour of lighting the Doha Asian Games torch during the Opening Ceremony. Rahman would have had five other team-mates including the new Yang di-Pertuan Agong Sultan Mizan Zainal Abidin of Terengganu, but they skipped Doha after competing in the Sultan's Cup Terengganu Endurance Challenge late last month. MESAIEED, Qatar: The blue bloods and Bedouins returned to the desert outside Doha for the one event the Arab states considered a formality for a gold medal at the Asian Games. The 51 jockeys who took off at sunrise in the 120-kilometer (74.5-mile) equestrian endurance ride included 15 members of Gulf royal families in an event designed to define the first Asian Games held in the Arab states. Hundreds of Qataris drove in their 4x4 vehicles in the desert, including 17-year-old Rashid al-Marri, who camped overnight Wednesday despite heavy rain along with five relatives waiting for the race in which his elder brother, Saoud, was taking part with the Qatari team. "We are coming to cheer for my brother Saoud," said Al-Marri, a white-and-maroon Qatari flag draped around his neck. "We want him to win the gold medal." Instead it was the United Arab Emirates team led by Sheik Rashid Al Maktoum, son of Dubai's ruler, that won both individual and team races, followed by Bahrain. "I did not win this race alone. It is also a win for the coach and the people of the Emirates," said Sheik Rashid, who was riding his father's favorite horse, the chestnut Magic Glenn, or Nashmi. Bahrain's Sheik Nasser Bin Hamad Bin Isa Al Khalifa, the son of the king of Bahrain, was second onboard the white horse Shar Rushkin, just in front of another Emarati, Sultan Bin Sulayem, on another white horse named Iknour De La Bire. "We are a real team, no doubt," said Sulayem. "The Sheik trains us, I feel equal to his sons. You might even see him advising riders from other countries, because he wants everyone to improve." Sheik Mohammed bin Rashid followed the progress of the leading group in a convoy of three 4x4 vehicles. As Sheik Rashid finished the race, his father was waiting for him and gave him a big hug. The Al-Marri family was just as supportive, at the other end of the field. As the Qatari rider moved slowly in the last loop of the race, men in 4x4 drove behind honking their horns to encourage the horse to move faster — until al-Marri waved for them to stop. The king of Bahrain presented the medals to the jockeys, while Qatar's Crown Prince Sheik Tamim bin Hamad Al Thani greeted the three medalists at the finish. Other members of the Al Maktoum and Al Khalifa families participated in the competition as well as three members of Saudi Arabia's Al Saoud family and three from Qatar's Al Thani ruling family. The Qatari team included Sheik Mohammed bin Hamad Al Thani, the son of Qatar's emir. Sheik Mohammed had a bigger role on the opening night, when he rode his steed up a ramp the full height of the Khalifa Stadium to light a giant gyroscope-like cauldron to mark the opening of the games. The 20-year-old Sheik Mohammed was part of the team that won the bronze medal Tuesday. Thursday's course included five loops, each between 15 kilometers and 30 kilometers (9 miles and 18.5 miles) in length. The first two loops were the longest and the last was the shortest. The competitors returned to the start point at the end of each loop for a medical examination. Horses were regularly vetted on the ride, where they were checked for soundness and dehydration. One of the sons of Dubai's ruler, Sheik Hamdan, did not continue the race after the third loop when his horse failed the test. Although most people enjoyed the race, several cars were seen near the route stuck in the mud — the drivers clearly were unhappy. Two individual Qatari riders arrived ahead of the field in the desert, as the convoy went past its first check point in the equestrian endurance event – a 120km race over sand. The first arrival clocked in at just under 84 minutes, 30km after the start. Saoud Al Marri, riding Nu Piece, and Mohammad Atta on Proavodo held a slight lead ahead of a group of 10 riders representing Qatar, Bahrain and United Arab Emirates in what has been a Middle Eastern-dominated race so far. Fifty one horses headed out into the desert after a mass start at 06:00 in the dawn light. Heavy overnight rainfall has made the track difficult and heavy. Team coaches and veterinarians say they expect problems in the later stages of the gruelling race on Thursday 14 December. Bahrain are the next best placed team. Their first rider making the first mark was Ahmed Hamad Saleh Al Rowaiei on Lormar Lorraine. Second for Bahrain was Sheikh Nasser Bin Hamad Bin Isa Al Khalifa on the grey gelding Shar Rushkin. The race was always expected to be dominated by countries and regions from from the Middle East. Korea and Malaysia are the only teams outside the Middle East with competitors in the event. Korea are competing on Qatari horses. The only true non-Arabic combination is Malaysia's Bin Muhammad Rahman Azman riding Colorado, a horse brought over especially from Malaysia for this marathon through the desert. But they have found the going tough and were more than 20 minutes behind the leaders at the fist checkpoint. Bahrain comes full force with three members from the ruling family. Sheikh Duaij Salman Mubarak Al Khalifa finished ninth at the 2006 World Equestrian Games in Aachen, Germany. Sheikh Nasser Bin Hamad Al Khalifa from Bahrain came 14th. The third is Sheikh Nasser Bin Al Khalifa on Shar Rushkin. United Arab Emirates are represented by four members of the ruling Al Maktoum family, with HH Sheikh Rashid Bin Mohammed Al Maktoum being the oldest at 25. The youngest, HH Sheikh Ahmed Bin Mohammed Al Maktoum, aged 19, won the title at the 2002 World Equestrian Games in Jerez, Spain, where endurance racing was introduced over a distance of 160km. Doha: The UAE endurance team is confident of a good showing in today's 120-km ride which has on offer medals in both the team and individual categories. The UAE team will, however, now have only five riders as only five horses were available. Ali Mohammad Al Muhairi will sit out the ride, which is making its debut at the Asian Games. But Shaikh Rashid Bin Mohammad Al Maktoum, who leads the team, was talking up their chances. "We have won major competitions before and this is a prestigious event for us. We are representing the UAE and it is a matter of pride," he told Gulf News at the weighing in. His Highness Shaikh Mohammad Bin Rashid Al Maktoum, Vice President, Prime Minister and Ruler of Dubai, who is a multiple gold medal winner in international championships, is expected to be present to guide the UAE team. "We will be following the instructions of our father and we will go all out to see the UAE flag fluttering high," Rashid added. "Hosts Qatar and Bahrain are also very strong but we hope to do well." Shaikh Rashid and his brothers Shaikh Hamdan, Shaikh Ahmad and Shaikh Majid will be bidding to create history at the Games. It is the first time that four brothers will be representing a team and attempting to win a medal. Sultan Bin Sulayem will be the other rider in the individual event. "The UAE squad is a team with the highest record of wins. It does not matter that we are one rider short as this could have happened soon after the start of the ride as well. We will go for gold," said Saeed Al Tayer, Vice-President, Dubai Equestrian Club. Kamel Armor, Jazyk, Muneef, Iknour De La Bire and Nashmi are the horses that the UAE riders will be aboard. The three best timings of the team will count towards the team medal classification while all five riders will compete for the gold, silver and bronze. Around 45 riders are expected to start in the 120-km event run over five loops. "We hope it does not rain in the night as it will make it difficult for the horses," said endurance trainer Esmail Mohammad. Hosts Qatar start with a big advantage as they have 12 riders in the fray while Bahrain is expected to pose a strong threat to the UAE's medal chances. An endurance rider from Equestrian Post country has topped off a great season with a wealth of wins at the Endurance Great Britain awards night. In 2002, this column recorded the success of Jeni Gilbert and her Connemara gelding Flurrie when they became Endurance Great Britain novice champions with the highest score possible. In the following years, Jeni, a member of the Endurance Great Britain West Riding Group, has enjoyed nurturing her horse through the Endurance GB system, gaining experience and knowledge along the way. Flurrie is not an easy horse in many ways and finding the right path for him has been a learning curve for Jeni and her crew. In 2006, Jeni targeted the rides and distances which she knew Flurrie enjoyed and her efforts were rewarded when, at the Endurance GB awards dinner, Jeni was presented with The Regent Trophy for highpoint unregistered horse. She also collected The Jasper Trophy for the highest points in their best three competitive rides, third place in the National Senior Championship and a prestigious third place in The Manar Trophy, which is the ultimate goal of the serious rider – The National Highpoint Championship. Val Swan, chair of the EGB West Riding Group said : "Members of our group who attended the awards ceremony went a little wild when Jeni was awarded her rosettes as they have watched her many successes with a knowing eye. This year has been their best yet with even more to come we think. "Flurrie has wonderful potential as a top endurance horse and is living proof that you don't need an Arab to shine at endurance." If you would like information on endurance riding in the West Riding, contact Val Swann, chair EGB West Riding Group, 24, Ascot Avenue, Horton Bank Top, Bradford, BD7 4PA. Abu Dhabi: Over 100 riders are expected to battle it out for a slice of the Dh400,000 on offer in the Nakheel-sponsored National Day Cup 120-km endurance ride on Saturday. Announcing details of the ride, Adnan Sultan Al Nuaimi, General Manager of Abu Dhabi Equestrian Club said most of the top riders in the UAE will be lining up for the prestigious event. "It is a FEI CEI Three-star event and will be run in five stages of 32kms, 30kms, 24kms, 18kms and 16kms," said Adnan. The ride will get off to a mass start at 6.00 am on Saturday, December 16, at the Emirates International Endurance Village in Al Wathba. Walid Al Jaziri, General Manager of Sales at Nakheel, the sponsors of the ride said they were very keen to lend their name to the National Day Cup. "We recently supported the race meeting here in Abu Dhabi and supporting endurance ride is part of our responsibility towards society," said Al Jaziri. Sultan Mizan Zainal Abidin, who became the youngest Malay ruler when he ascended the Terengganu throne at the age of 36 in 1998, will also be among the youngest to be proclaimed Yang di-Pertuan Agong on Wednesday. Under the five-year rotation system, Sultan Mizan will be proclaimed the 13th Yang di-Pertuan Agong, succeeding Tuanku Syed Sirajuddin Syed Putra Jamalullail, who ascended the throne on Dec 13, 2001. Sultan Mizan 44, will be the second youngest Yang di-Pertuan Agong after Tuanku Syed Putra Almarhum Syed Hassan Jamalullail of Perlis who took office as King on Jan 4, 1961 at the age of 41. A ruler concerned about the welfare of his subjects, Sultan Mizan makes efforts to go to all mosques in Terengganu for Friday prayers to be with the people and also continues with the practice of giving alms to orphans and the poor every Friday as done by his late father, Sultan Mahmud Al-Muktafi Billah Shah. During his younger days, Sultan Mizan was like any other boys his age and liked to play football. 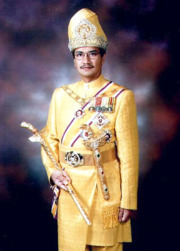 Sultan Mizan's concern for the well-being of his Terengganu subjects prompted him to set up the Sultan Mizan Royal Foundation, launched on July 19, 2005, in conjunction with his 43rd birthday, to organise and finance various programmes, including in research, forestry, science, technology and innovation, agriculture, fishery and community projects. Sultan Mizan is also active in sports like football, golf, taekwondo and scuba-diving but due to his busy schedule, is only able to concentrate on equestrian sports. The Sultan likes horse riding and has formed the Royal Terengganu Endurance Stable (RTES) to prepare the state for participation in equestrian sports locally and abroad. 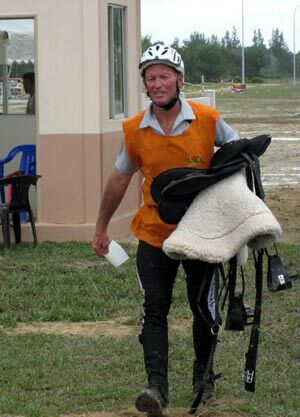 His skills in horse riding is reflected in him winning the Wilga 80km Endurance Ride, Wilga Australia, and in a competition at Harris River Ride, Perth, Australia in 2004. He was also selected to represent Malaysia at the Asian Games in Doha, Qatar, but had to withdraw his participation as the event coincides with the proclamation ceremony. It is also through Sultan Mizan's dedication and initiative that Malaysia is selected to host the World Endurance Championship at Lembah Bidong, Terengganu, next year. RIDING long distances and racing the clock is all in a day’s work for Finch Hatton endurance rider Melissa Longhurst. She has been chosen in a four-member Australian senior team to compete at the Trans Tasman Series Endurance Ride, to be held at Nelson, New Zealand, on January 2. Australia will also send a four-person junior team to contest the same race. The race is over 120km, to be completed in one day, traversing mountainous country and flat sections before coming back to base, when the horses must pass stringent veterinary checks before being allowed to continue on. She heads off on Boxing Day with strapper and fellow Sarina endurance enthusiast Juanita Lamb, but will not compete until January 2. A horse took centre stage at the Opening Ceremony of the 15th Asian Games Doha 2006. For the first time in the history of the Games, a horse was involved in the act of lighting the cauldron. Final torchbearer Sheik Mohammed Bin Hamad Bin Khalifa Al-Thani cantered up a steep ramp the height of the stadium to light the flame. The horse, with specially adapted shoes for extra grip, slowed momentarily halfway up the ramp, but continued on to complete the stunt. The horse may have been temporarily blinded by the hundreds of camera flashes from the spellbound spectators. Al Thani is the coach of the Qatar Endurance team. The purebred brown Arabian horse he chose for his well documented ride was trained in Australia by Steven Jeffery, who starred as the Lone Rider at the 2000 Sydney Olympic Games. Three horses were trained in Australia for the stunt over an eight-month period, and the sheik chose his mount only a day before the opening ceremony. Horses play a vital part in Arabian traditions and that was beautifully demonstrated in front of 50,000 spectators and millions of TV viewers all around the globe in a choreography called "Tribute to the Desert Horsemen". Riders in white traditional vestments and 64 horses did their freestyle. Growing Asian interest in equestrian is evident in Doha where the number of participating teams in Dressage and Jumping has nearly doubled from previous events. With Endurance included for the first time, medals will now be decided in four disciplines. Eventing, the oldest discipline at the Asian Games, started in 1982, but Doha is the first Arabian location to host a cross country competition. DOHA: Arabian horses galloped against a shimmering backdrop of thousands of neon-lit pearls as the 15th and biggest Asian Games opened with a multi-million dollar sensory feast on Friday. Qatar's Emir Sheikh Hamad Bin Khalifa Al-Thani declared open Asia's biggest ever celebration of sport during a spectacular display of fireworks, twinkling lights and traditional Asian dancing, played to the sound of 40,000 beating drums. The climax of a lavish ceremony came when the Emir's son Mohammad, the Qatari endurance team captain, charged up the steps of the Khalifa Stadium on a pure-bred Arab gelding to light the 50m cauldron that will burn throughout the Games. The 2008 FEI World Endurance Championship Trial run was held last weekend at Terengganu, on the East coast of Malaysia. 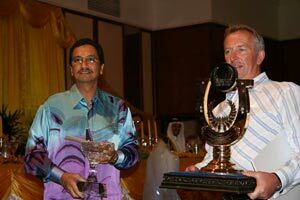 The Championship had been provisionally granted to the Malaysian Equestrian Federation subject to there being a number of successful trial runs held in 2006 and 2007. HRH Sultan Mizan Zainal Abidin invited several of the world's top riders to participate in the event to demonstrate the quality of the venue for the pending 2008 World Endurance Championship. The International riders were to ride horses of the Royal Terengganu Endurance Stable, and were to draw on their skill and experience to test the suitability of a tropical venue for a World Championship event. New Zealand riders Kevin James and Paul Jeffrey were among the International competitors. James successfully completed the 160km CEI*** event on a horse from the Royal Terengganu Endurance Stable. He was among the 13 competitors who completed the 160km course, resulting in a 57% completion rate for the event, and finish times far faster than had been anticipated. Jeffrey navigated the 7 yr old gelding Jakim Zane to a 1st place finish and Best Condition award, setting a Malaysian record for fastest finish time on an 80km course. Australian rider Brook Sample also tested the 160km course but his horse, also from the Royal Stable, was eliminated for back soreness at the 120km point. Three senior FEI Endurance Officials attended the event: Dr Hallvard Sommerseth (NOR), Chairman of the FEI Endurance Technical Committee; Dr Jim Bryant (CAN) and Mr John Robertson (GBR). The Malaysian Equestrian Federation, together with the Organising Committee (OC) - the State Government of Terengganu and Yayasan Kebajikan Perkasa Alam Terengganu, invited a number of leading Malaysian riders as well as riders from America, Europe and Australsia. A detailed report is being produced; it will be submitted to the FEI Endurance Techncial Committee for further consideration but Dr Hallvard Sommerseth expressed his appreciation for the commitment made by the organizers in producing a very successful trial run. The FEI Endurance Committee had required the trial run to be held at the proposed venue on a date to match the date of the 2008 Championship and for there to be a minimum completion rate of 40% and a maximum riding time of 16 hours for the 160km distance. A total of 23 horses were presented at the start of the event and 60% completed the full distance well within the maximum ride time allowed. All of the horses performed well with no heat and humidity related problems. Dr Jim Bryant confirmed that the horses had competed well under the conditions which had been relatively cool because of the timing of the event within the monsoon period. He commented that all of the riders had taken great care to compete using all of their horsemanship skills. Dr Bryant linked the performances of the riders and horses to a time within Endurance when events were less about speed and more about the combination of rider and horse working in close harmony together to overcome the challenges presented. Mr John Robertson felt that there were certain areas which needed to be reviewed in relation to the overall management of the event. He confirmed that the OC was aware of these issues but he was confident that the OC would be able to solve them ahead of the Championship. Dr Sommerseth confirmed that the next trial event, scheduled to take place in the first half of 2007, would involve the use of overseas based horses who would travel to Malaysia to test out the facilities and also to fully evaluate the timing required to allow overseas horse to acclimatise properly ahead of competition. A team from FEI Television attended the event and will produce a short documentary to be shown at the planned FEI World Endurance Forum planned for March 2007. BAHRAIN's top riders Shaikh Nasser bin Hamad Al Khalifa and Shaikh Daij bin Salman Al Khalifa will be looking forward to impress in endurance horseride competition at the Asian Games. They qualified after taking 14th and ninth positions respectively at the World Equestrian Games in Aachen, Germany on August 21. Despite driving rain and poor visibility, Shaikh Daij managed ninth place and provided a bright note for Asian equestrian fans on a day in which a fancied team from the UAE was eliminated. The 159 starters from 42 nations had faced a gruelling 160km race through hilly terrain which included six veterinary checks. For many of the riders, the competition came to an early end, with less than half completing the ride. Some were withdrawn from the competition by the vets, while others retired voluntarily. It was left to Shaikh Daij, riding the 11 year-old Shar Rushkin, to lead home the Asian riders although he dropped from fifth place to ninth on the final leg. Shaikh Nasser, the Bahrain Royal Equestrian and Endurance Federation president, was riding the 10 year-old Ganda Goy. For Saudi Arabia, Prince Abdullah bin Fahad Al Saud finished 18th, riding the 12 year-old Keroch. was held last weekend at Terengganu, on the East coast of Malaysia. trial runs held in 2006 and 2007.
in producing a very successful trial run. time of 16 hours for the 160 kms distance. Growing popularity in the sport of endurance riding has seen a full-length endurance race added to the Kelt Capital Horse of the Year show (HOY) for 2007. Show director Kevin Hansen said endurance had been run once before at the 2005 show over a shortened 50km course, but only as a promotional event. The 2007 race would take place on Friday, March 16 and be run over 110km. The race would start at 6am in the premier arena of the showgrounds, cross mainly private lands out to Ocean Beach and finish at 3pm in Napier Road, Havelock North. The leading horses would then proceed up Te Mata Road and into the Havelock Domain. A full team from South Africa, traditionally a strong endurance nation, would add an international flavour to the competition. THE 15th Asian Games was officially opened yesterday by HH the Emir Sheikh Hamad bin Khalifa al-Thani at Doha?s Khalifa Stadium in a breathtaking ceremony that merged a film shown on the world?s biggest LED screen with a spectacular show performed by several thousand artists. Alison Bailey riding K-Zar Emmanuel at the Carolina 100. Alison's late husband Mike rode K-Zar to the AERC National 50-Mile Heavyweight Championship before he passed away from a sudden heart attack 11 days later. Alison went to the Carolina Ride to win the 50 in memory of her husband. She not only won, but K-Zar earned the Best Condition Award! Lois McAfee and Tonka Toi won the 100 mile division of the November 25 Carolina 100 Endurance ride. IT was first time lucky for Nik Sabaruddin and his mount As Shiffa Kassan who won the the 160km Sultan's Cup Terengganu Endurance Challenge 2006 at the Terengganu International Endurance Park in Lembah Bidong, Setiu, on Sunday. The 53-year-old former Navy officer and his 14-year-old Arabian pure-bred, who were representing Kelantan's D'Bali Stable, won with a time of 12:38:43s to beat 22 rivals and pocket the RM10,000 winner?s cheque. As Shiffa Kassan was also voted as the best conditioned horse in the category which came with a RM2,000 bonus. Second place went to Datuk Abdullah Taib and his horse Blue Moon who clocked 12:49:45s, while Faizal Ismail, astride Azreal, finished third in 12:53:26. The second and third place finishers took home RM8,000 and RM6,000 respectively. Fourth was Norlaily Buniyamin who took home RM4,000. Other riders in the category included the Sultan of Terengganu, Sultan Mizan Zainal Abidin. In the 80km event, Paul Jeffrey and his mount Jakim Zane won in a time of 05:32:35s from Amal Nadiah Tajuddin astride Rayyan who clocked 29:45s. Third place went to Stephanie Teeter (Jakim Murphy) while Nazalisamri Nasaah (Nagawangsa) finished fourth. A total of 120 riders competed in the two-day event. WHAT IS THE ENDURANCE EVENT? · Endurance riding is an extremely strenuous form of horse racing which tests the speed and endurance of a horse. It involves racing at controlled speeds over distances of many tens of kilometres. During the 15th Asian Games, the endurance course will cover 120 km. · A good endurance horse is characterised by balanced body structure, relatively light weight and a strong back. Any breed can compete but Arabians, endowed with natural stamina, generally dominate at the top levels. Most importantly, the horse?s temperament must suit the rider. · Wendell Robie, an American breeder of Arabian horses, is credited as the pioneer of the modern sport of endurance riding. In 1955, he founded the founded the Western States Trail Ride, a 160-km, one-day ride from Lake Tahoe to Auburn, California, via an old Pony Express route. · Endurance was a demonstration sport at the 1992 Barcelona Olympics and was recognised as an official discipline by the International Federation for Equestrian Sports (FEI) in 1983. The sport makes it Asian Games debut in Doha. · An endurance ride is a competition against the clock. The horse that finishes the course in the shortest time wins. The winning team is the one with the best time after adding the classifications of the three highest placed competitors. · Horses must be at least six years old to qualify. Competitions are held in phases, with no phase longer than 40 km. When the condition of a horse is assessed at the end of each phase, its heart rate must be no higher than 64 beats per minute. · FEI guidelines state that the course should not contain more than 10 percent of hard surface roads intended for vehicular traffic. Also, the most demanding part of the course should not be near the finish. Dubai: Yousuf Ahmad Al Bloushi from the Al Reef Stables registered a hat-trick of wins for the all-conquering stables here yesterday. Yousuf, the UAE's top trainer and third-best rider on points, and Al Reef Stables, last season's top stables which belongs to Shaikh Tahnoun Bin Zayed Al Nahyan, scored their third straight win of the current UAE season. Yousuf, who trained the winning horses in the Boudthib Junior Ride and the First Gulf Bank Challenge ride in Al Wathba last week, emerged as winner with a superb display of riding in the Dubai Equestrian Club's 120-km ride yesterday. Dubai: The Dubai Equestrian Club's endurance season, which kicks off today at the Dubai International Endurance City, will also feature an innovative addition - Dubai Endurance Challenge for whole the season. Announcing details at a press conference, Saeed Humaid Al Tayer, Vice President of the Dubai Equestrian Club, said today's inaugural ride sponsored by Dubai World will carry a total prize money of Dh700,000. Meanwhile, the Dubai Endurance Challenge unveiled yesterday, is also worth Dh700,000 and will take into account all FEI rides staged at the Dubai International Endurance City for the 2006-2007 season. During the season Riders, Trainers, Horses and Stables will earn points depending on their finishing position in the selected rides. At the end of the season the highest point scorers will be crowned the Dubai Endurance Challenge Champion Rider, Trainer, Horse and Stable respectively. Sultan Ahmad Bin Sulayem, Chairman, Dubai World, who is also a top rider, said, "Support for any equestrian sport comes naturally to us in the UAE. This is particularly so when it comes to events featuring Arab Purebred horses. These noble animals are a part of our cultural identity. Dubai World is especially proud to be sponsoring the opening race in this year's Endurance calendar and we look forward to enjoying the show." Saeed Humaid Al Tayer said, "We value the support of each of our sponsors who help to make each of the races a reality. The sport is closely linked to the culture and heritage of the people of the United Arab Emirates and we invite everyone to attend the races at the Dubai International Endurance City to enjoy the spectacle that is Endurance racing." Meanwhile, Al Reef Stables will be looking to complete a hat-trick in today's 120-km CEI Three Star ride. They won the first two rides of the season held in Abu Dhabi and will be strongly represented in today's 100-plus line-up of starters. Young Shaikha Madiya bint Hasher Al Maktoum has many achievements to her credit. She proudly wears the mantle of the rich sports legacy of the ruling Maktoum family, is an accomplished horse rider and a fitness enthusiast as well. She speaks to Sue Steven in an exclusive interview. Shaikha Madiya bint Hasher Al Maktoum, the niece of His Highness Shaikh Mohammed bin Rashid Al Maktoum, Vice-President and Prime Minister of the UAE and Ruler of Dubai, is at ease in the place she loves most ? the Maktoum stable, located 37 kilometres from Dubai. Not forgetting her roots, she has a very modern outlook to life and is at ease talking to Weekend. A very down-to-earth person, she is comfortable wearing blue jeans, a white full sleeve shirt with the colours of the UAE flag on one of the sleeves and a cap with 77, her lucky number, embroidered on it. She sits on a wooden bench outside one of the buildings with her two dogs, Lily and Stinky who keep a close watch on her. Shaikha Madiya is a very strong advocate of fitness and exercise. She has endorsed The Middle East Fitness Summit ? MEFIT06, scheduled to take place in Hall 4 at the Dubai World Trade Centre from November 27-29. The summit is part of Sportex, the largest sports, fitness and leisure show in the Middle East. ?Women have to make fitness a part of their daily routine. There is a dire need for education in health and fitness. I feel the Fitness Summit is a very relevant initiative to address a lot of topics, concerns and myths associated with health and fitness,? she says, as she urges women in the UAE to be conscious of their physical well-being. ?RPM and Bodycombat are my favourites,? the Shaikha adds without hesitation. RPM, part of the Les Mills programme, is the indoor cycling workout where you ride to the rhythm of powerful music. You take on the terrain with an inspiring coach who leads the team through hills, flats, mountain peaks, time trials, and interval training. ?You can discover your athlete within ? sweat and burn to reach your endorphin high. You can cycle for 45 minutes or 60 minutes,? she says. Bodycombat, on the other hand, is the empowering cardio workout where you are totally unleashed. This fiercely energetic programme is inspired by martial arts and draws from a wide array of disciplines such as karate, boxing, taekwondo, tai chi and muay thai. Supported by driving music and powerful role model instructors, you can strike, punch, kick and kata your way through calories to superior cardio fitness. Shaikha Madiya practises what she preaches. She herself is very particular about her fitness routine on a daily basis especially running and jogging. She is up at 4.30am in the morning and by 5.30am is training her horses. In the afternoon, at 2.30pm, she again takes them out and trains them for endurance. The Shaikha does not hide her passion for horses. She is very vocal about it. ?Initially my family was worried that I would get hurt while riding. So I started being involved in this sport only after I completed 16 years. I learnt at my uncle?s stable. He supports me and helped me train for endurance.? She speaks out of experience: ?If you are a horse person you will know the language of the horses. You can talk to them and play with them. You have to change their mind to endure the sport. If they hate what they are doing, they will not do it well.? She welcomes national women to participate in the sport. ?My stables are open to national women who would like to pursue the sport, ride and learn,? she says. Horse breaking, sometimes called starting or gentling, refers to the process used by humans to get horses to let themselves be ridden or harnessed. Before such a learning process is accomplished, a horse will normally reject attempts to ride it. Once it has accepted basic handling by humans, additional forms of training can be used to teach the horse any number of specialised skills. Presently Shaikha Madiya has 49 horses in her stable that were brought from the US. ?They have to get used to the ground and to the heat. It is a slow, step-by-step process,? she adds. How long does it take to train a horse? She says, ?Every horse is different and so the time of training also differs. Some horses even get injured during training. You have to win them over and by two years break them, which means put the saddle and bridle on them. They learn to have human contact as the rider sits on it. Endurance training takes place after the horse completes five years.? While training horses, the trainer is learning as well. Shaikha Madiya has firsthand experience of taking care of her horses. ?Experience is invaluable. Every time you ride, you learn something new from the horse. It has been 10 years since I started, and I am still learning,? she admits, frankly. Shaikha Madiya could be compared to a horse whisperer, a horse trainer who adopts a sympathetic view of the motives, needs, and desires of the horse. She admits that she loves the challenge to rehabilitate horses that have become vicious and difficult. ?I love crazy horses as you have to fix them. I take the horses to different race courses like Nae Al Sheba. They enjoy the experience. She uses GPRS that specifies the location and even has an instrument to monitor her heart rate. How is endurance racing different in the UAE? In the UAE, it is speed that matters, the Shaikha says. The ground is just flat, not hard. In the US, the ground is hard, so one can?t go fast. If you do, you get hurt. In the US, each race is different as the terrain is different like mountains, hills and flat areas. She advises national women to join some kind of sport. ?If not every day, find time for at least three times a week for physical activity. It is good for your body and mind.? Shaikha Madiya hails from a family of six children, four girls and two boys. Her sister is in the volleyball team of Al Wasl while her brother loves shooting. ?I love challenges, horses, fitness, everything,? she says. In future, she would like to be a fitness instructor and help other local women. She strongly believes that a healthy body will have a healthy mind and raising awareness about nutrition is paramount. ?I teach my niece to eat in a healthy way. As a result, she refuses junk food now,? Shaikha Madiya says with pride. When asked where she gets her energy from, she says that she sleeps early and gets up early. Shaikha Madiya strongly believes in the ?early to bed, early to rise philosophy,? that supports her fitness initiatives. Abu Dhabi: Shaikh Majid Bin Mohammad Bin Rashid Al Maktoum and Shaikh Hazza Bin Sultan Bin Zayed Al Nahyan are part of a nearly 100-strong line-up for today's 120-km First Gulf Bank Challenge endurance ride. The 120-km ride is being held under the patronage of Shaikh Mansour Bin Zayed Al Nahyan, Minister of Presidential Affairs, at the Emirates International Endurance Village in Al Wathba. Other top riders in the five-stage ride which gets off to a 6am start include Shaikh Khalid Bin Sultan Bin Zayed Al Nahyan, Shaikh Saeed Bin Maktoum Bin Khalifa Al Maktoum and Shaikha Madiya Hasher Mana Al Maktoum. Riders from the Al Reef Stables, the champion stable of last season will be looking to add to their triumph in the junior ride last week. Other consistent performers in the fray are last year's top domestic rider Marzooq Salem Al Merri, Yousuf Ahmad Al Bloushi, Ali Mohammad Al Muhairi, Ali Khalfan Al Jahouri, Abdullah Khamis Ali Saeed and Spain's Jesus Manuel Berna. A strong team of riders from Uruguay along with riders from India, Pakistan, Australia, Great Britain, France Saudi Arabia, Canada, Sri Lanka and Bangladesh are also in the fray. photo: EQUAL AT FINISH: Pat Dickinson (left) and Noble Navaar Crystal Rose and John Symons and Worobil Baringa who crossed the line together at Sofala on Sunday. Mudgee riders had mixed results when the participated in the 30th Sofala Endurance Ride last Sunday. The 52 riders in the 80klm main ride started off in daylight at 5.30am without the need for torches and headlamps but some of the Mudgee contingent made a late start after they missed their wake up call. Word is kangaroos caused havoc in the camp overnight and kept them awake and by the time the alarm went off they we sound asleep. Riders appreciated a well marked track and the humid conditions that developed as the day wore on were tempered by colder conditions with good clud cover. The course was testing, however, with many climbs and descents on the mountain made difficult where it was rocky while the drought conditions ensured conditions were hard underfoot. The conditions may have proved too much for Gloria Mills and her mount Glendos Sabodie as they had to withdraw at Wattle Flat when making the return stage of the first leg. Mills, who has had a super year with her horse and will be the Mudgee club's top middleweight for the year despite Sunday's setback, said she withdrew because she felt the horse wasn 't travelling well. Those Mudgee riders who did have a good result were Bernice King (Noble Navaar Destiny), Pat Dickinson (Nobla Navaar Crystal Rose and Paddy Smith (Shata) who were all successful in the long ride. Daphne Phillips enjoyed the return to endurance of her former ride winner Crown Crest Phantom whom she steered around the training ride. Wendy McLehose (Bruwenic Raina Girl) enjoyed the training ride with her eight year old son Nicholas (Bruwenic Strawberry) who was in his first ride. Nicholas was so excited at finishing the ride that he was talking of another ride next week. Another debut rider was Virginia King (Kalentish Tips) who enjoyed her initial endurance experience. Woody Pilley (Mystery) had a flock of junior riders in tow for the event in his sons Justin (Box Hill Breaker) and Blake (Meroo Downs Dolly) and was also accompanied by the boys' friend Seaton Croake (Reggie) making the ride an enjoyable family event. All these riders completed the 30 klms training ride, which had 33 participants. In the overall result four riders crossed the line in an equal fastest time of 4 hours 29 minutes. They were Kate Pilley of Windeyer riding Pancho who was first in lightweight; Jamie Mollema of Bathurst riding Billywillinga Rocky who was first junior and Jennifer Gilbertson of Webbs Creek who shared first middleweight. Fittest horse in the catchweight (a combination of lightweight and junior divisions) division was Pancho. The ride was a great success with organisers especially pleased with the number of junior and first time riders taking part a boost for the future of the sport. On the occasion of the FEI Bureau meeting taking place in Dubai on 17 and 18 November, HRH Princess Haya Bint Al Hussein delivered her 150 days-in-office Report. Its objective was to present the progress made against the FEI PresidentÂ?s election Manifesto and its translation into policy and tangible benefits. Significant developments have been achieved in many areas. This is an interim news release which represents the general course the FEI is taking. A more detailed release on the various items presented to the Bureau will be published after the meeting. CONSTRUCTION work on the new Scottish National Equestrian Centre at Oatridge by Ecclesmachan is expected to be completed by December 15. And early in the new year, on a date still to be confirmed, a free open day will be held to allow clubs, groups and individual riders to try the best facilities in Scotland for themselves. SNEC director Carson Jones said: "We've had tremendous support from equestrians all over Scotland since the inception of the project so, in part, the open day will be our way of saying thanks to them. "It will also give us an early opportunity to test our booking system and our organisation, but most importantly, it will allow riders to come in and see for themselves just how good ? and how big ? the centre actually is." Carson and his team have drawn up a programme of international events for the £3.5 million facility. However, they are just as keen to finalise the regular, day-to-day use of the centre, including the new pro wax surface, installed by Andrew Bowen and endorsed by some of the UK's top riders. Mondays have been earmarked for open schooling sessions, for as little as £10 a head; Tuesdays will be for dog training; Wednesdays for unaffiliated showjumping; Thursdays for Pony Clubs and members; and Fridays possibly for unaffilated dressage. Events already lined up for 2007 include a major Scottish Equestrian Association event in January; a visit by former Pat Parelli trainer Bruce Logan from Texas in February; British Vaulting's international team selection in March; the Pony Club annual conference and Scottish Spring Show in April; Welsh Pony Society Show in May; Oatridge Horse Trials in June; western riding show in July; British Show Pony Society event in August; and an FEI Endurance 2 Star event in September. Carson added: "These events are just a taste of what's to come. The calendar is filling up rapidly with equestrian and non-equestrian events. "We're also lining up a lot of club competitions and as more SEA members realise that they can hire the facilities for as little as £510 for the day, we expect many more. As if that isn't enough, we're also planning a gala opening event. You could say the Scottish National Equestrian Centre is off and running!" To register for a trial schooling session, call centre events manager Richard Negus on 01506 864800. Dubai: The captain of the UAE women's endurance team is pleased with the drastic changes taking place in the world of women's fitness since the past few years. "It's really amazing to see so many health and fitness clubs and programmes exclusively dedicated for women in the UAE," stated Shaikha Madiya Bint Hasher Al Maktoum in an exclusive interview with Gulf News. "A few years back there were maybe a few health clubs or absolutely nothing for women here. But this is no longer the case as so many new clubs and facilities have come up exclusively with the modern-day woman in mind," Shaikha Madiya stated. As the captain of the UAE women's endurance squad, Shaikha Madiya has lent her support for Mefit06 - the Middle East Health and Fitness Summit scheduled to be held at the Dubai World Trade Centre from November 27-29. "I believe in staying healthy, and the best way to do so is to participate in sports," Shaikha Madiya said. The Middle East Health and Fitness Summit will be held alongside Sportex 2006. "I used to be overweight. But I saw the importance of keeping healthy and got involved with certain fitness programmes which have helped me reduce weight and stay focused on my endurance riding," Shaikha Madiya stated. Mefit06 has invited prominent fitness personalities including Malcolm Geluk, Kerry Hill, Steve Renata, Rob Richards and Susan Tolj. "The conception for fitness especially among women has changed quite a bit in the past two of three years. This is for the best, and I feel it will get much better in the near future," Shaikha Madiya observed. "There are so many themed fitness programmes keeping women in mind," she added. Being in a physically demanding sport like endurance riding, the UAE skipper knows she has to keep to a high level of fitness. This starts very early in the day with rising time fixed for 4am every day. "I have a couple of personal favourite fitness programmes like the RPM and body compact. These help me and complement my sports activities," she stated. "As a sportswoman, my challenge would be to convince women to keep healthy. I am speaking from personal experience. If one is healthy, then one is also happy. "Healthy living is so crucial to our general state of happiness," Shaikha Madiya said. "I will attend the Mefit06 exhibition and endorse it," she added. THE National Sports Council (NSC) have not rated the equestrian team as medal prospects in the Doha Asian Games. But this will not stop the 16-member squad from aiming to secure medals for the third consecutive Asiad. The dressage team (silver) and Quzier Ambak (bronze in the individual showjumping) returned with medals from Bangkok in 1998 while the showjumping team cantered to the bronze at the Busan Games in 2002. In Doha, the charge for honours will be led by Qabil Ambak, one of three members of the squad with two Asian Games medals in their name. The others are his elder brother, Quzier, and Syed Omar Al-Mohdzar. Qabil is also on a personal mission to do well in Doha to make up for his miserable outing in Busan. Despite securing a bronze in the showjumping team event, the 2001 National Sportsman of the Year would rather forget his Busan exploits. His problems started when his mount, Camelias, was denied entry by the South Korean authorities after failing a medical test. And Qabil was injured while training at the competition venue. He was thrown off and stepped on by his replacement horse, Humphreys. The injury affected Qabil's medal hopes in the individual events and also forced him to relinquish his duties as the country's flag bearer during the opening ceremony. "At the last Asian Games, everything went wrong even before I landed in Busan. "This time, I am more aware of the situations that might occur and will take the necessary precautions," said Qabil from his training base in Belgium. "I will be competing in four events in Doha ? the dressage and showjumping individual and team events. Having won a silver and a bronze, I have now set my sights on the gold." He admitted that it would take a herculean effort from the Malaysian riders to make the podium in Qatar. "With horses, a lot of factors, including the conditions during the day of the competition, will determine our chances to win," he said. "I hope everything goes well for Malaysia and that the equestrian competition is run in a fair and friendly manner in Doha." It has not been all smooth sailing for Qabil in his preparations for Doha. His two favourite horses, Camelias and Opium Metado, died in June and August respectively. This has forced him to rely on a new mount, Parvina. "It was hard to lose two of my best partners as I had years of partnership with them," he said. "I just got Parvina at the beginning of the year and I am working hard to bond with her. "I am glad that despite the short period of time, my new partnership seems to be going well." Qabil also admitted that the short acclimatisation period for the horses could turn out to be a problem for Malaysia's chances in the competitions. There had been plans to send the horses to Doha earlier but the idea was scrapped due to the high maintenance costs involved. "My horses will leave from Europe on Nov 27 and there is only a week to acclimatise before the competition starts," he said. "It would be tough as the current climate in Europe is much colder than the Middle East. "It might affect some horses but I hope they can manage the temperature change well." Also in the squad is Sultan Mizan Zainal Abidin, who will be competing at the Asian Games a few days before taking office as the country's 13th Yang di-Pertuan Agong on Dec 13. The Terengganu Sultan is one of six Malaysian riders for the endurance events together with Shamsudin Roni, Mohd Izry Razali, Mohd Rino Rani, Norlaily Buniyamin and Rahmat Azman.